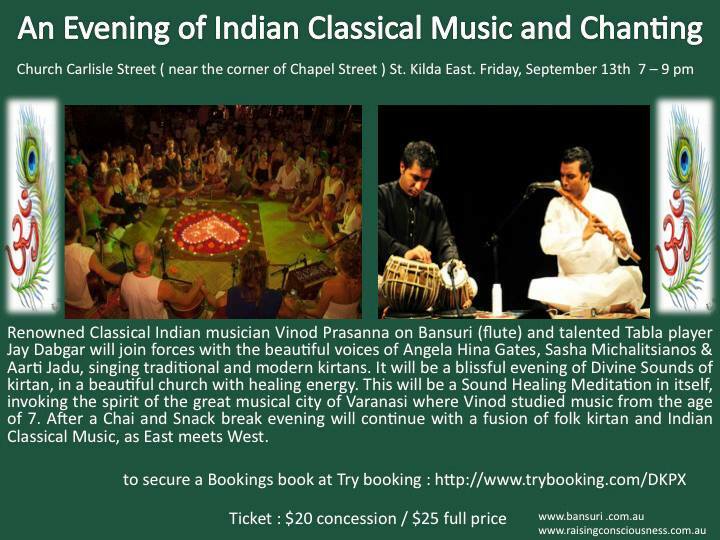 Renowned Classical Indian musician Vinod Prasanna on Bansuri (flute) and talented Tabla player Jay Dabgar will join forces with the beautiful voices of Angela Hina Gates, Sasha Michalitsianos & Aarti Jadu, singing traditional and modern kirtan. It will be a blissful evening of Divine sounds of traditional and modern kirtans in a beautiful church with amazing energy. This will be a Nada Yoga Meditation in itself, invoking the spirit of the great music city Varanasi where Vinod studied music from the age of 7. After a short break the evening will continue with a fusion of folk kirtan and Indian Classical, as East Meets West.